All presentations from the RSMP can be accessed here via the ICCA World Slideshare! You can also take a look at all photos from the RSMP on the official ICCA Facebook here. Martin Sirk wrote a comprehensive check-list as a result of his session 'Business on the Books'. Click here to download this check-list. ICCA Research, Sales and Marketing Programme 2014 - What is it? The RSMP is specifically designed for meeting industry professionals who work with association meetings research, new leads generation, marketing or sales. Every year the event provides fresh expertise, stimulating ideas and teaches new skills. The RSMP programme is not only tailored to the specific needs of research, sales and marketing professionals as a whole, but also to the individual needs of each delegate. How do we achieve this? 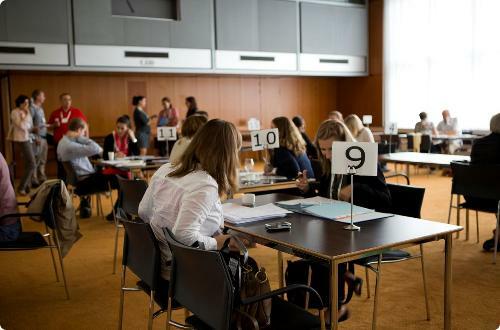 By providing opportunities for individual consultancy appointments with a wide range of leading meetings industry experts and association clients. Delegates are welcome to bring their own specific business problem or project and seek consultancy for its solution, and to make the return on investment even more immediate, we organise a Business Exchange.